Charles Young was born into slavery in Mays Lick, Kentucky, on March 12, 1864. In 1865 he and his parents escaped slavery crossing the Ohio River to Ripley, Ohio. Young attended the all-white high school in Ripley, graduating at the top of his class in 1880. After teaching for a few years at Ripley’s black high school, Young took a competitive examination for appointment as a cadet at the United States Military Academy at West Point and in 1883 reported to the Academy. He graduated with his commission as second lieutenant in 1889, only the third black man to do so. Though initially assigned to the Tenth U.S. Cavalry Regiment, he was reassigned to the Ninth U.S. Cavalry and promoted to first lieutenant. He spent his early career with the all-black regiments – the “buffalo soldiers” as they had been referred to since the Indian Wars. Indeed he spent much of his 28 years of military service with black troops, to include the Ninth U.S. Cavalry. In 1903 Young served as captain of a black company at the Presidio of San Francisco. He was appointed acting superintendent of Sequoia and Kings Canyon national parks, becoming the first black superintendent of a national park. In his role as superintendent, Young was responsible for supervising payroll accounts and directing the rangers’ activities. His greatest impact on the park was road construction to improve the underdeveloped park and improve access for visitors. Young and his troops ultimately accomplished more that summer than the three military officers who been assigned the previous three years. They completed a wagon road to the Giant Forest and a road to the famous Moro Rock. With the end of the brief summer construction season, in November 1903 Young was reassigned as the troop commander of the Tenth U.S. Cavalry at the Presidio. In his final report to the Secretary of the Interior on Sequoia National Park, he recommended that the government acquire privately held lands there, to secure more park land for future generations, a recommendation later included in legislation introduced in the U.S. House of Representatives. The Visalia, California, Board of Trade would present Young with a citation recognizing his contributions as acting superintendent of Sequoia national park. Young would go on to serve as a military attaché in Port-au-Prince, Haiti, and later join his Ninth Regiment in the Philippines. In 1912 he was assigned as military attaché to Liberia, the first African American to hold that post and for three years served as an expert advisor to the Liberian government. He then commanded a squadron of the Tenth U.S. Cavalry during the 1916 U.S. Punitive Expedition into Mexico, at one point leading a charge against Pancho Villa’s forces. 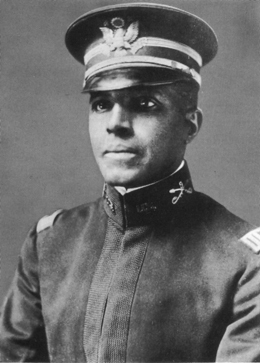 He was promoted to lieutenant colonel in 1916 and a year later became the first black to achieve the rank of colonel in the U.S. Army. The U.S. Army removed Young from active duty in 1917, but he returned to active duty in 1918 and became the military attaché to Liberia. Young died in 1922 while on a reconnaissance mission in Nigeria and was buried at Arlington National Cemetery. On March 25, 2013, President Barack Obama designated the house and farmland outside Wilberforce, Ohio, that Young had purchased back in 1907 as the 401st unit of the national park system – the Charles Young Buffalo Soldiers National Monument.